Contracting third party companies for operational fulfillment is an increasing practice and despite the advantages this management practice offers, Contractor Management still remains a major headache for many companies. 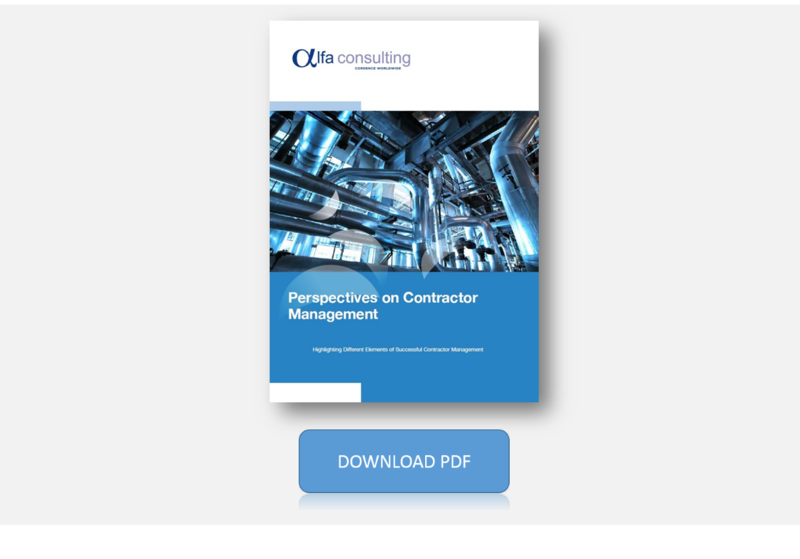 Why should I care about Contractor Management? A significant part of the budget of any company is in the hands of third parties and increasing with the globalization of projects and complexity of value chains. In this high risk and complex relationship, contractors directly impact a company’s bottom line and image, and organizations need profitable and reliable partners. Managing not just the contract but the entire contractor life cycle has become a prerequisite for successful project execution. In today’s environment, working with contractors presents great opportunities but also significant challenges. For this reason, we are pleased to share with you Perspectives on Contractor Management: Highlighting Different Elements of Successful Contractor Management, a document developed by Alfa Consulting in collaboration with other members of the Cordence Wolrdwide Alliance, which explains the complexity of the subject, highlighting the different aspects of the practice and the key solutions that our experts offer from different perspectives.